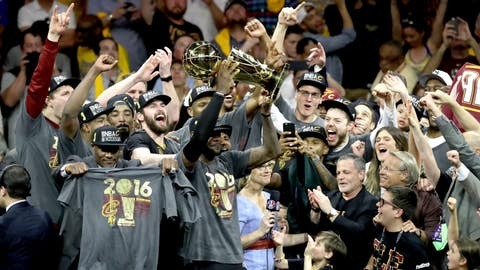 Where do the Cleveland Cavaliers rank among past title-winners? WhatIfSports.com simulated a tournament featuring the Cavs and the last 25 NBA champions. The Cavaliers’ first title in franchise history puts the team among elite company, joining the fraternity of past championship-winning squads. But where does Cleveland fall in the pecking order? Using WhatIfSports.com’s NBA simulation engine, we placed the Cavs into a round-robin tournament featuring every Larry O’Brien Trophy winner since the 1990-91 season. In the simulation, every team played every other team 51 times. The Cavaliers finished 20th in the 26-team field, winning 43.6 percent of their games. Cleveland’s 100.7 points per game ranked fifth, but the team surrendered the most points in the tournament, yielded 102.2 points per contest. In addition to suiting up for the Cavs, LeBron James played for the 2011-12 and 2012-13 Miami Heat as well. The latter earned a second-place finish in the tournament, winning 64.5 percent of contests. The 2011-12 Heat were right in the middle of the pack with a 49.4 winning percentage. The 1995-96 Chicago Bulls came out on top in the tournament, winning 69.1 percent of contests. Their 93.4 points allowed per game was the fourth-lowest output. Three other Bulls teams — the 1991, 1992 and 1997 title-winners — finished in the top 10 as well. For more power rankings, view WhatIfSports.com’s simulation of the Golden State Warriors vs. the last 25 NBA Finals runner-ups.